Support for the war in Afghanistan has reached an all-time low, with only 27 percent of Americans saying they back the war. 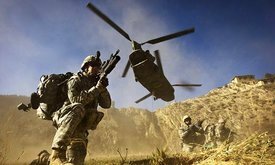 Support for the war in Afghanistan has hit a new low and is on par with support for the Vietnam War in the early 1970s, a bad sign for President Barack Obama as he argues that to end the war responsibly the United States must remain in Afghanistan another two years. Only 27% of Americans say they back the war effort, and 66% oppose the war, according to an AP-GfK poll released Wednesday. A November 1971 Harris poll showed a record-high 65% of Americans said that continued fighting in Vietnam was "morally wrong." By that time the United States was already drastically cutting the size of its fighting force in Vietnam on the road to a full withdrawal in 1973. The 11-year Afghan war has not been highly popular among Americans for many years, but support has dropped off steeply. A year ago, 37% favored the war, and in the spring of 2010, support was at 46%. The AP poll does not spell out why people have changed their minds. But the drop-off in support parallels rising casualties, increased attacks on Americans by the Afghan soldiers they are mentoring and inconclusive battlefield gains that have increased security in many areas of the country but have failed to break the Taliban-led insurgency. About half of those who oppose the war said the continued presence of American troops in Afghanistan is doing more harm than good. Chris Solomon, an independent from Fuquay-Varina, N.C., is among the respondents who strongly oppose the war. He said the military mission has reached the limits of its ability to help Afghans or make Americans any safer, and he would close down the war immediately if he could. While the rationale for the war is to fight al-Qaida, most of the day-to-day combat is against an entrenched Taliban insurgency that will outlast the foreign fighters, Solomon said. He said the conflict is reminiscent of Vietnam. "What are we really doing there? Who are we helping?" he said in an interview. A similar feeling of frustration with a little-understood conflict taking place far away turned a majority of Americans against the Vietnam War. The unpopularity of the war played a large role in the downfall of a Democratic president, Lyndon Johnson, and forced his Republican successor, Richard Nixon, to scale back the war and ultimately end it without a U.S. victory. The context is very different now, without a military draft that fueled the Vietnam War's unpopularity and with a comparatively tiny force of 88,000 now deployed in Afghanistan. At the height of the war in 1968, more than 530,000 U.S. forces were serving in Vietnam. 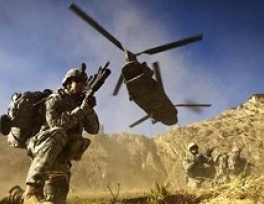 Obama has promised to keep fighting forces in Afghanistan until sometime in 2014, despite the declining popular support. The effort to hand off primary responsibility for fighting the war to Afghan soldiers will be the main focus of a gathering of NATO leaders that Obama will host later this month in Chicago. That shift away from front-line combat is expected to come next year, largely in response to growing opposition to the war in the United States and among NATO allies. The shift makes some military commanders uneasy, as does any suggestion that the U.S. fighting force be cut rapidly next year. Obama has promised a steady drawdown. Obama acknowledged the rising frustration during a surprise visit to Afghanistan last week. He signed a 10-year security pact with Afghan President Hamid Karzai and congratulated U.S. troops on the anniversary of Osama bin Laden's death at the hands of U.S. Navy SEALs. He told troops that he is ending the war but that more of their friends will die before it is over. "I recognize that many Americans are tired of war," he said then. "I will not keep Americans in harm's way a single day longer than is absolutely required for our national security. But we must finish the job we started in Afghanistan and end this war responsibly." As of Tuesday, at least 1,834 members of the U.S. military had died in Afghanistan as a result of the U.S.-led invasion in late 2001, according to an Associated Press count. Obama has argued that his persistence in hunting down bin Laden is one reason to re-elect him, and his on-time handling of the wars in Iraq and Afghanistan is another. Obama closed down the Iraq war on the timetable set when he took office and expanded the Afghan fight that had been neglected in favor of Iraq. He is now scaling back in Afghanistan, bringing troops home by the tens of thousands. A small U.S. counterterrorism and training force may remain in the country after 2014. But in a trend that complicates discussion of the war in this year's presidential campaign, support for the war is plummeting even among Republicans. People who identified themselves as Republicans backed the war at 37%, down from 58% a year ago. Among Democrats, support dropped from 30% last year to 19% now. More than a quarter, 27%, of independents favor the effort, similar to the level last year. Nearly half, 48%, said the continued presence of U.S. troops in Afghanistan is doing more to help Afghanistan become a stable democracy, while 36% said the opposite and 14% said they didn't know. Among those opposed to the war, 49% say U.S. troops are hurting more than helping. Three-quarters of those who favor the war think they are doing more to help. Republicans are most apt to see U.S. forces as helping, with 56% saying so, followed by 47% of Democrats. Among independents, more say troops are hurting Afghanistan's efforts to become a stable democracy (43%) than helping (32%). Slightly more than half of Americans, 53%, said they approve of Obama's handling of the war, while 42% disapprove. Obama hit a high mark in AP-GfK polling on that question a year ago, just after the killing of bin Laden. Then, 65% said they approved of his handling of the situation in Afghanistan. The poll showed 64% approve of Obama's handling of terrorism issues, and 31% disapprove. Elizabeth Kabalka of Chattanooga, Tenn., said she somewhat approves of the war and is generally pleased by Obama's handling of it. An independent voter, she said Obama is doing about as well managing the war as anyone could. "He's got a really crappy job," she said. "I've been pleased with him. He's really tried to stick to a position." The Associated Press-GfK Poll was conducted May 3-7 by GfK Roper Public Affairs & Corporate Communications. It involved landline and cellphone interviews with 1,004 adults nationwide and has a margin of sampling error of plus or minus 3.9%age points. AP Deputy Director of Polling Jennifer Agiesta, News Survey Specialist Dennis Junius and researcher Rhonda Shafner contributed to this report. Al Qaeda battle in Afghanistan to stretch for years: U.S.